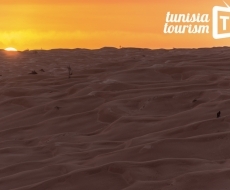 From Tozeur to Tataouine via the vast sandy desert, the Tunisian South is a true world of its own whose diversity will amaze you. Explore mountains, the oases or the Berber villages, go hiking, bivouac under the stars… and even play golf. Walk among the immensity of the desert dunes, bivouac under a starry sky, taste the nomads’ traditional bread, stop for a rest under a stand of palm trees in the middle of nowhere...the Sahara is a magical experience. Whether you choose a gruelling hike, a quad or 4x4 rally or a simple outing into the desert, you will live through unforgettable moments. Paved roads will take you as far as one of the gateways to the sandy desert: Douz, Nefta, Ksar Ghilane or, in the extreme south, El Borma. Then, you will begin to enter the Grand Erg Oriental or Great Eastern Sand Sea (in Tunisia, it extends over 40 000 square kilometres). On foot or aboard a 4x4, making progress is a gruelling affair… but what a reward to suddenly discover a giant dune, a hot water lake or a field of desert roses! Your soul doesn’t long for adventure? Stay in a modest established camp, and experience the pleasure of watching the dawn break above the dunes. 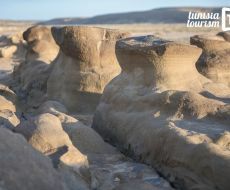 The Tunisian Sahara, however, is not limited solely to the sand desert; it’s a fairytale universe of infinite variety. By 4x4, by motorbike or by bike, follow the small roads or tracks of the South East: a rugged world known as the “desert of stone”. Deep into these majestic Dahar mountains, you will spot Berber villages perched in the heights. Here and there the enormous collective granaries of the nomads arise, known as Ksour. Explore one: climb a ladder to enter one of the superimposed chambers where harvests were once stored. 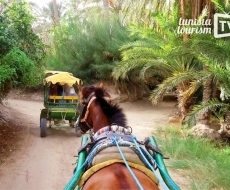 Another place, another experience: now you’re sat aboard a carriage in a giant oasis. 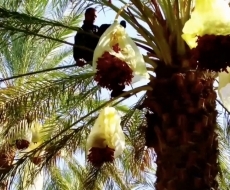 You stop to visit a cultivated garden where fruits and vegetables grow in the shade of the tall palms; before your eyes, a man climbs one of them with incredible speed to harvest bunches of dates. Two large medinas can be found in the oasis region, Tozeur and Nefta, veritable labyrinths of narrow streets. Take advantage of your stay in Tozeur to tee off at the Golf Oasis, visit a museum of ancient objects, or spend a fun day as a family in the “accro-palm” park. Desert of sand, desert of stone, oasis… the list of unusual spots doesn’t end here. Still to cross is the “desert of salt”, the Chott el-Jerid: a vast white and glittering expanse left by the evaporation of a saltwater lake. Another one not to miss are the mountain oases: waterfalls and palm groves springing miraculously from a landscape of sand-coloured mountains. Take the little vintage “Lézard Rouge (Red Lizard)” train which snakes through the bottom of a canyon… you’ll bring back unforgettable memories. A comfortable camp magically situated in the middle of the Sahara : Camp Mars to the south of Douz. An adventure course with zipline in a palm grove : Sahara Lounge in Tozeur. If you are visiting the Dahar region, download the free application Destination Dahar (on App Store and Google Play). 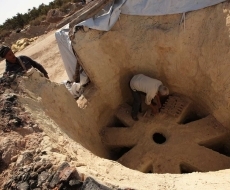 These former collective granaries are typical of the Dahar region in the Tunisian South East: nomads would store their harvests here to shelter them from looters. Some occupy the summit of steep peaks; the largest resemble enormous stone-coloured beehives rising up in the middle of desert plateaus. Each family would have a chamber to store their harvest. In the Ksour region, Chenini and Douiret are two Berber villages perched upon rocky hilltops. The ancient houses are partly dug into the mountainside. Giant tombs can be found at the foot of Chenini’s mosque; a legend resembling the one of the Seven Sleepers (or People of the Cave) is told about them. In Douiret, you can visit an ancient subterranean or troglodyte mosque. One of the most stunning sites in Tunisia: craters dug into the arid hills hide veritable subterranean houses. Visit other nearby Berber villages such as Tamezret. Discover the fictional village of “Mos Espa” in the heart of the sand dunes: it’s the real film set of one of the Star Wars episodes, still intact at a place called Ong Jmel close to Nefta. One of the subterranean houses of Matmata also makes an appearance in the saga: the Lars family home. 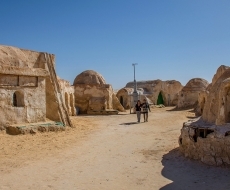 Read more: Star Wars in Tunisia, to the birthplace of the Skywalkers. This vast 5000 km2 depression is covered with a crust of glittering salt, the remains of an former saltwater lake – however, certain sections are still flooded in winter and draw gatherings of pink flamingos. Not far from the Chott el-Jerid, in Debebcha, strange mounds rise up: dunes of petrified sand. The foothills of the Saharan Atlas, in the extreme west, form unique landscapes. In this mineral universe oases appear deep into the mountains: Chebika and its oued (river) tumbling down the mountain, Tamerza and its waterfall, Mides suspended above an imposing canyon. What else is there to see after a trip to the Tunisian South? The Sahara is a world apart which is worth a long visit for itself alone. Nevertheless, you can prolong your visit by visiting historical sites, for example the archaeological site of Sbeïtla (Roman and Byzantine era) or the medina of Kairouan. And if you’re in the mood for freshness and luxury after having explored these arid regions, nothing better than a stay in one of Djerba’s beautiful hotels to finish your trip.